These two little bears are still in their original package and still attached to the original cardboard back that they came with. The box itself shows some wear and has a tear in the top. It has obviously been opened and looked into several times, but the little bears have only been removed so that they could be photographed. The bears are about 3 inches wide and 3 inches tall and about an inch and a half thick. The entire package weighs 3.4 ounces. These are a creation of Russ Berrie and Company, Inc. 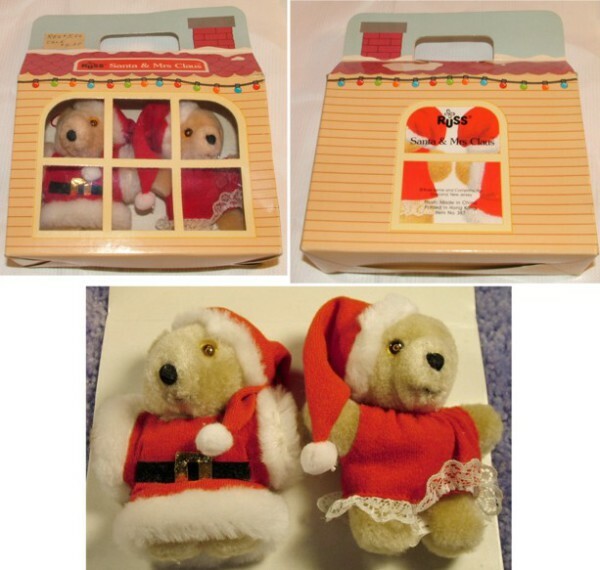 The bears were made in China and the box was printed in Hong Kong. They are marked with the item number 387. This plush mouse sports an Old West Sheriff outfit. His ears, hands, feet, scarf and sheriff's star-shaped badge are made of stiff felt. His star badge looks as if a tiny mouse has nibbled at it a bit. His shirt, hat and nose are made of a felt-like material and his body is made of a furry, plush grey material. His tail is a piece of grey yarn . He has a tag attached to his body as well as a string tag. The tag states that he is from the Pets and Pals Collection, item number 4711, made in Korea in 1979. The string tag is dated 1978. The cardboard of the string tag has been bent in half and shows signs of wear and age. 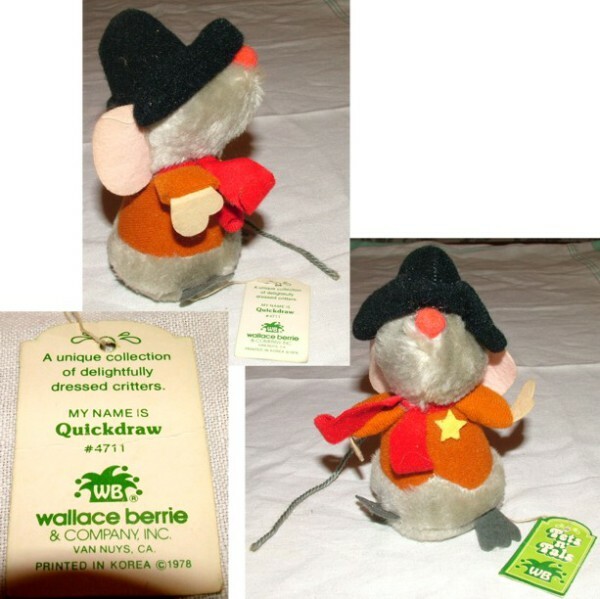 Quickdraw mouse is 5.5 inches tall and about 3 inches wide and deep. He weighs 2.1 ounces. This mouse is at least 35 years old and in good condition.